Go here to view the rest of my spring flower pictures. I finally washed the blanket! It took me a year (or better) of goofing around but I finished crocheting this queen-size 100% cotton, double-crochet blanket for my dear nephew. I am particularly enamored with the border. One of these days the people who already got one of my blankets are going to send me photographs of them. Hint, hint, nudge, nudge. I taught myself to crochet from several different “teach yourself to crochet” pamphlets. I still am baffled by the code the patterns are written in and, as a result, everything I crochet is made up as I go along. And I pretty much stick to squares and rectangles. Like blankets. And double-thread bath mats. Although I did make a brief foray into hats. They actually worked out pretty well and I wear the two I kept for myself when it’s cold outside. My one attempt at a simple pullover sweater was hilariously bad. I’m “in the process” of ripping the whole thing out so I can use the wool-blend for scarves and hats. Six restaurants and a dry cleaner on Peterborough Street in the Fenway neighborhood of Boston are now gone. The four-alarm fire started some time after two a.m. on January 6 in Thornton’s Fenway Grill, destroying it and the string of adjoining one-story storefronts which housed Sorento’s Italian Gourmet, Umi Japanese Restaurant, Greek Isles, Rod-Dee Thai Cuisine II, El Pelon Taqueria and a dry cleaner. I lived in the Fenway (the West Fenway, actually) from 1987 to 2001, first on Park Drive, then on Queensberry Street. One of the best things about living in the Fenway was its wonderful, inexpensive restaurants. I hardly ever cooked. I didn’t need to. Plus it’s tradition in the Fenway to eat out. I loved living in the Fenway. This small, six-block neighborhood was developed in the 1920s for “gray-collar” workers who were mostly single and ate in automats. The kitchens are hilariously small. Even the kitchens in the rare three-bedroom apartments were the same size as those in the one-bedrooms. Amazingly, they had pretty decent closet space. The Fenway is bordered by the Back Bay Fens which contains, among other things, the Fenway Victory Gardens, the oldest continuously-used victory gardens in the United States. I had a garden there from 1989 to 2001. It was wonderful. Patty checks on the blueberry bushes, early spring 1999. 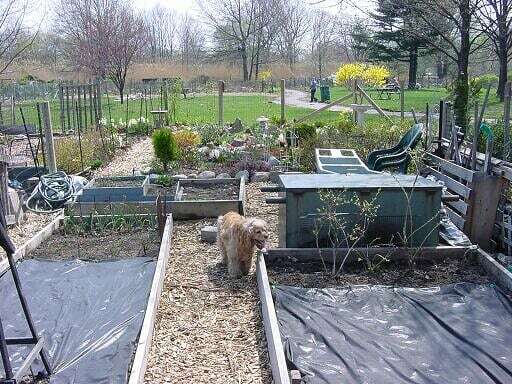 My garden was three adjoining plots, each approximately 15 by 30 feet — one for vegetables, one for flowers and one for hanging around with my friends. I was really lucky because my garden abutted the picnic table area so when my friends and I had parties we could spill out onto the lawn. When I moved to southeastern Massachusetts I brought the garden with me — plants, shrubs, trees, large rocks and cobblestones. James & Patty with some friends circa 1999. When I got a phone call this morning from a friend who still lives on Queensberry Street, I was of course concerned about the devastation to those employed at those businesses but my next thought was that this fire was no accident. This stretch of one-story store fronts is an untapped real-estate gold mine. Slowly but surely, all of the commercial space in the West Fenway has been converted into very expensive, five-story residential condo buildings while a variety of malls are built which are aimed at the commuters and day-trippers. Any benefit to the surrounding residents is coincidence. 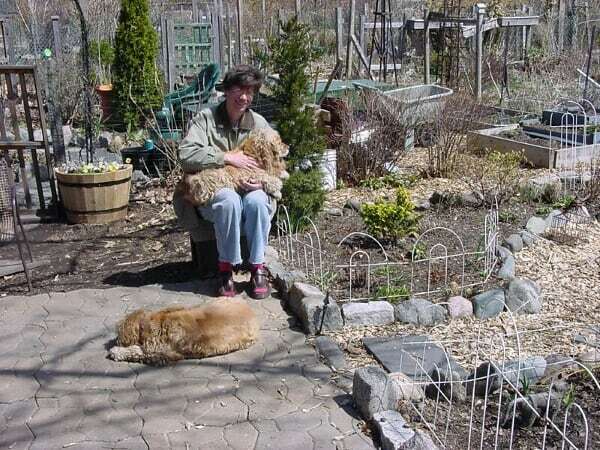 Me & my former canine companions relaxing in the garden, early spring 1999. Now, you may be asking yourself, “Why is she whining about five-story buildings?” Holding developers to that height requirement is the best the residents have been able to do. The only reason we haven’t been getting taller buildings is the “historic” nature of the neighborhood — nothing else is higher than five stories. Unfortunately, the nature of its population is not deemed worthy of protecting the way the outward appearance of the real estate is. All that’s left of the one-story commercial buildings are the laundry mat, a convenience store and a Thai restaurant, Brown Sugar, on Jersey Street. Canestaro’s Pizza is the only restaurant left on Peterborough Street. It’s at the lower end of the street. I’m not sure whether Buteco, a Brazilian restaurant — or its building — is still across from the convenience store on Jersey Street. There’s a single one-story storefront on Kilmarnock Street that housed a relatively pricey barbecue restaurant the last time I was aware (at least five years). The small coffee shop next to the laundry mat was still there when I passed through on my way to get snacks on Peterborough Street a year ago. There was a small, independent hardware store, next to the Boston Cab garage, at Kilmarnock and Queensberry but it closed in the late 1980s. The landlord wanted more rent than the store could pay. The space sat empty for almost ten years before it became a cheap sandwich joint. The junk store/neighborhood gossip center that used to be next to the coffee shop on Kilmarnock has been empty now for five years, the store owner priced out by ridiculous annual rent increases. The empty one-story storefront that we used for a neighborhood drop-in center for a couple years in the early ’90s was finally torn down two or three years ago and a five-story condo building was put up. The neighborhood association tried very hard to get a commercial tenant in that space over the time I lived there but the building was in very bad shape and the landlord could afford to let it sit empty and blighted till someone bought it for the land. I left Boston after 24 years because it had become simply too ridiculous trying to live there without a car. After the Woolworth’s closed in the late 1980s, shopping for household items became a strategic nightmare involving numerous buses and subways or hoping a friend who had a car was available. The profit margin on useful stuff doesn’t cover the rent and that shithead of a mayor thinks having a “world class” city more important than a livable city. He and his helpers in the state government have been dismantling the subway system for decades. And use zoning to preserve small businesses? Ha! And with three of my favorite restaurants reduced to ash, I am hard pressed to get excited about a visit. Next I am going to hear that India Quality restaurant has closed! Mmmmm, beef curry! Mmmmm, nan! I still mourn the loss of Yen Ching Palace, the greatest Chinese restaurant that ever lived. Across from the Boston Public Library on Boylston Street, I ate there from 1978 till it closed in 1998 (or ’97?). Their shredded pork! Oh, their Peking raviolis! Ah, their cold beansprouts! Oooh, their spring rolls! And a hot-and-sour soup by which I measured all other hot-and-sour soups! Their Cambridge branch, despite having an identical menu and owned by the same people, was not the same at all. It’s the things I’ve eaten that stir the strongest memories. Thinking about Yen Ching Palace brings up remembrances of Mandalay, a swoon-inducing Burmese restaurant that I lunched at when I worked at Northeastern University in the 1980s. Oh, yes, oh, yes, oh, yes — tamarind! But pardon me, I got distracted from my bitching. Loss of these restaurants will be ruinous to the sense of home a person has living in the Fenway. For a neighborhood to really work for the people who live in it, mixed-use is essential. The fire has drastically shifted the balance in the Fenway. My condolences to all who live there. This snow actually fell on December 31, 2008. I shoveled as much as there is in the video that day so I could go to the store to get NyQuil for my icky cold/flu. As a result of that “visit” I have been banned from CVS. The employees at my local CVS — in fact, every CVS I have ever been in — are the laziest bunch of assholes you would ever not want to have interfacing with the public in a sales capacity. I’ve Fallen Off The Deep End. I’m splashed all over Youtube.